Near Rugby; across the Warwickshire - Northamptonshire border. It meets the M1 at junction 17. It's quiet (by that I mean barely used - even at rush hour), as it's pretty much bypassed by the newfangled upstart motorway in the area - the M6. There's also a stunning lack of signposting! The answer - get as much traffic as possible off the motorway system before the end, hence the M45 (getting traffic off towards Coventry and Birmingham), and the M10 at the southern end. 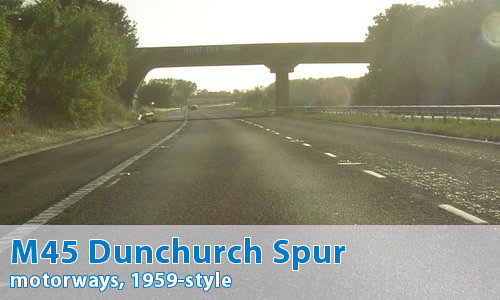 Apart from the barrier down the middle, and the 1990s addition of the middle junction to act as a by-pass of Dunchurch, the M45 is almost exactly the same as it was in 1959. Driving down it gives you a great idea of what motorway travel in the 1950s and early 1960s was like. Yes, CBRD (www.cbrd.co.uk) has a speeded up QuickTime video available for viewing. It's eastbound, so the opposite direction to the Photo Gallery!